As much as I love to travel the world, there are few places as beautiful as the English countryside on a fine summer’s day, and few spots as perfect as the Dorset coastline when the sun is glinting out to sea. Since my lung operation, I’ve been impatiently counting down days before I felt ready to bike, and eventually travel again. South America already seems a distant land, but I’m determined not to let my plans to return there slip away. I’m feeling better day by day. 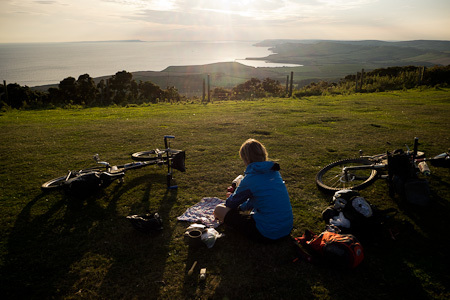 Sleeping on a Thermarest is still a little awkward, and hysterical laughter reduces me to yelps of pain… With the stitches healing up nicely, I figured I’d ease my way back into the saddle with a bikepacking trip to the Purbeck Hills, using my parents home in Dorset as a base. This is where my love of mountain biking was born, so it seemed a fitting place to return to. What’s more, it would also provide the quintessential English experience for Nancy, visiting from the US. 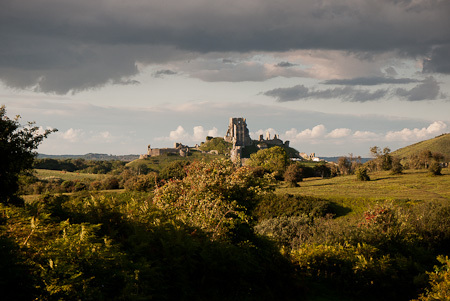 Situated on the south west coast, the Isle of Purbeck has long been one of my favourite stomping grounds. 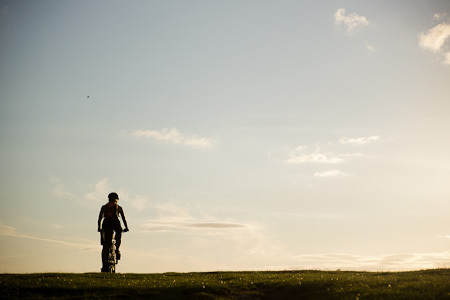 While the mountain biking may not be technical, it’s sure to work the lungs. And considering its diminutive size, this little parcel of land really packs in the big views. Long, steep and sometimes rocky climbs are rewarded by meandering, ridgetop rambles. From up high, mellow views are the order of the day. 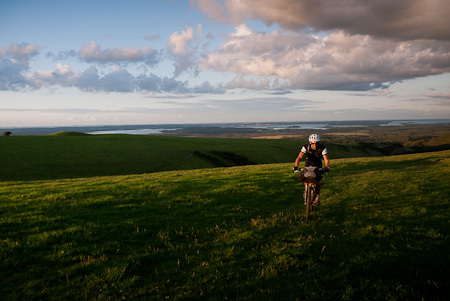 The Purbeck is a land of gently rolling, almost manicured hills. 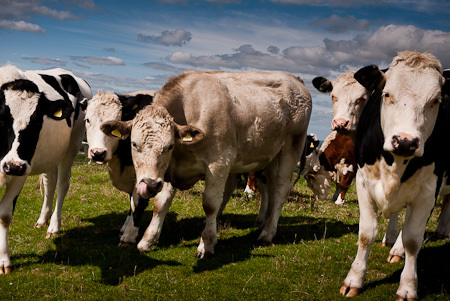 Its sheep-nibbled and cow-munched pastures seem freshly mown. 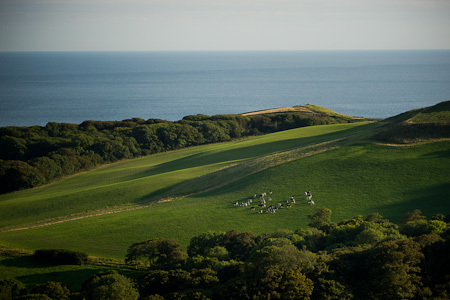 There are campsites, often in simple fields, dotted all across the peninsula. 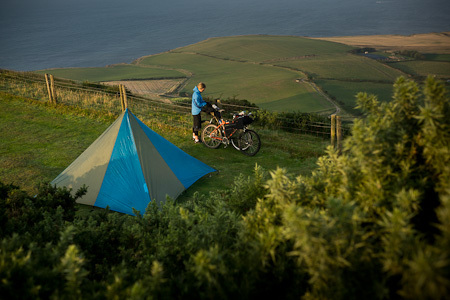 Nancy and I preferred to stealth camp up on Swyre Head, the highest point of the Purbeck Hills, affording views out to the Isle of Wight. 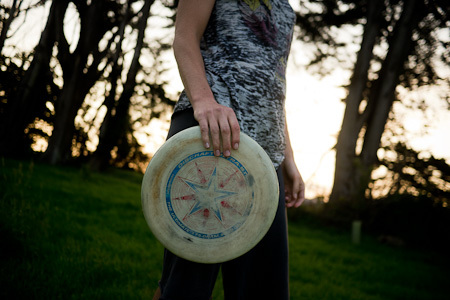 First though, Frisbee Action. As it happens, this frisbee just squeezes into my Camelbak, with the added bonus that it doubles as a plate come dinner. Then the cooking began, as the last, golden beams of the summer's afternoon clipped the hill tops. I love a kitchen with some space and a decent view. 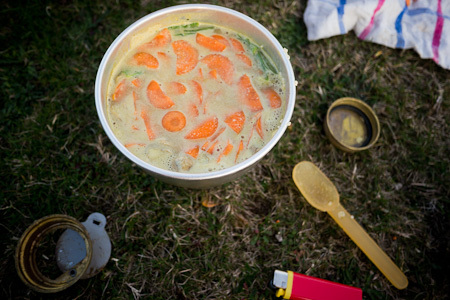 Fresh carrots and spring onions came courtesy of my parent's garden, cooked up on the Mini Trangia. To these we added diced ginger, red lentils and couscous, a wholesome concoction that more than satisfied our grumbling bellies. 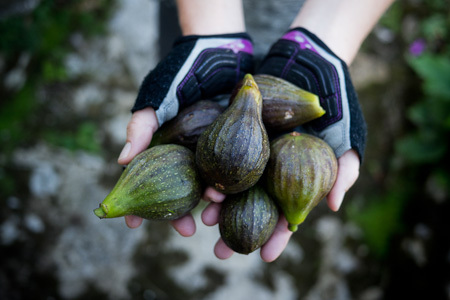 Along with a handfull of sweet and tasty figs, also homegrown. 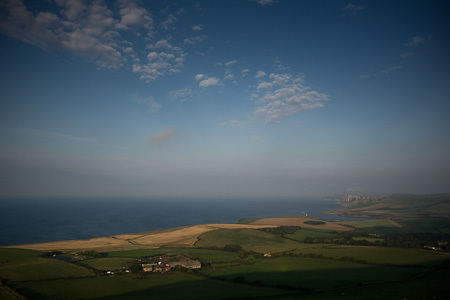 Our view, looking out towards Clavell Tower at Kimmeridge, as we dined. More ridgetop cruising in the morning. 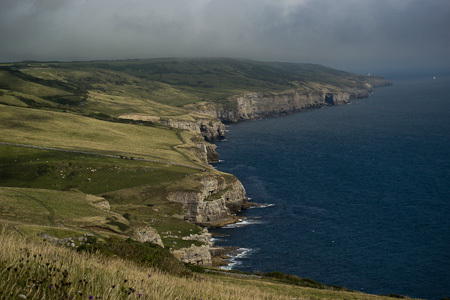 The Purbeck is famed for its Jurassic Coastline, its rocks embedded with dinosaur footprints. 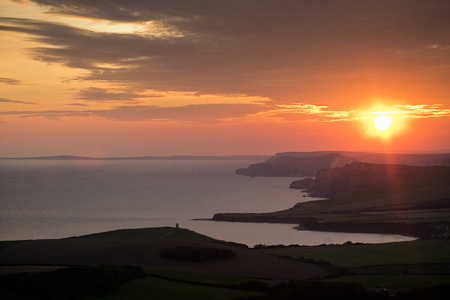 This is the view below Worth Matravers, just a short walk away from the fabled Square and Compass pub, home to cider and pasties. 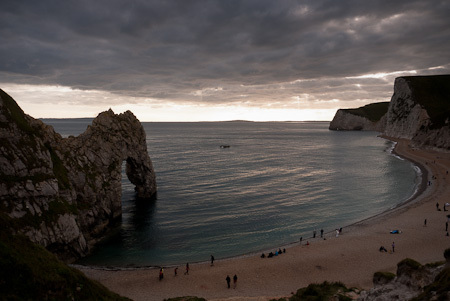 A geographer's paradise: the limestone arch and pebble beach of Durdle Door. Here, we leapt into the sea and braved frigid waters for an invigorating swim. Bike Club: the telltale marks of battles with oily chainrings. My rig. 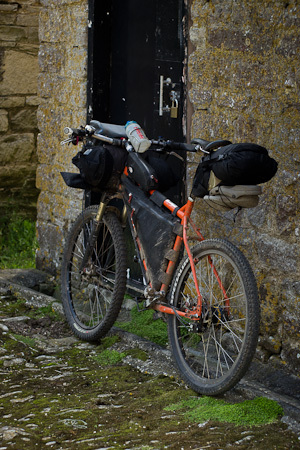 I'm still honing my ultimate bikepacking setup, based around a Surly Troll, clad in Porcelain Rocket clothing. A key ingredient is this PR expandable seat pack - or Booster Rocket, as it's called. 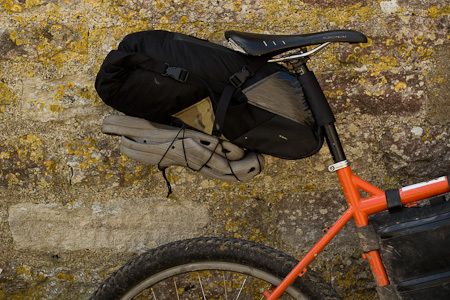 It's effectively the modern day version of a Carradice saddlebag, and gulps down a 3/4 Thermarest, Tyvek groundsheet, Black Diamond Megalight tarp and a change of clothes, with room still for a pair of Crocs bungeed below. 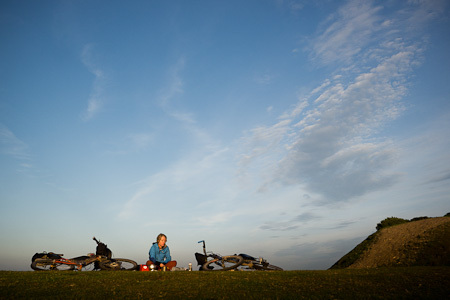 The Top Tube Pack fits snacks, a knife, headtorch and a rear LED. 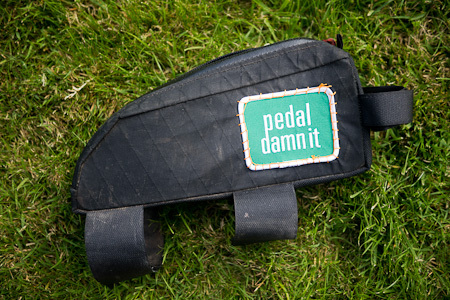 Mine has been coolified with a patch from local bikeshop Charlie the Bikemonger. In my pursuit to carry ever more H20, I'm trying a King Cage adaptor. 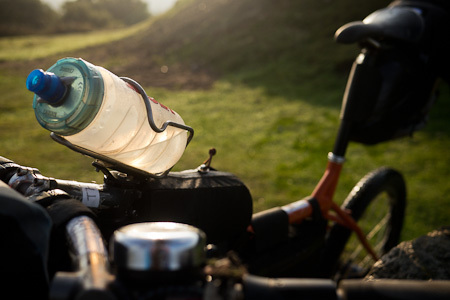 It replaces the top cap bolt on the stem to provide a mount for another water bottle cage. Nancy rode this Thorn Catalyst, to which we fitted a Trek rack, integrated rackop bag, a mini Top Tube Snack Pack and an Ortlieb bar bag. No problems there, until we noticed, some miles later, that the bag had been unceremoniously ejected from the bike on a rough descent. Luckily, a kindly rambler picked it up and dropped it off at Swange Police Station. Wareham has a train station for car-free travel. Check out the health food store there, Purbeck Wholefoods, for loading up with supplies. Their muesli is delicious, as are their yoghurt coated flapjacks. 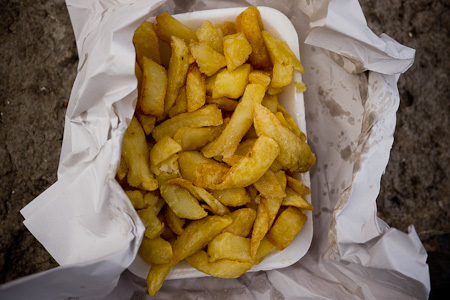 For wholesome, locally sourced grub, there’s the Salt Pig, also in Wareham. Free wifi access too. There’s a bike shop at the train station for all your basic needs, and another in Swanage, by the name of Charlie the Bikemonger: ‘purveyor of damned fine 29er, singlespeed and fixed produce’. Timewarp. Great fish and chips are to be enjoyed amongst the squarking seagulls and squabbling kids in Swanage. 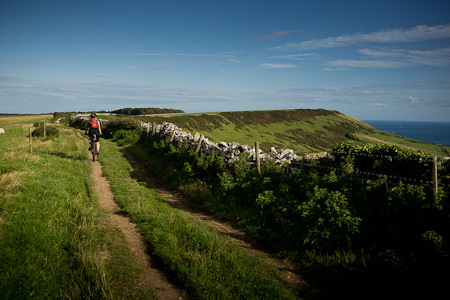 For the full Purbeck experience, sip a pint of cider and a tuck into a pasty at the Square and Compass, Worth Matravers. 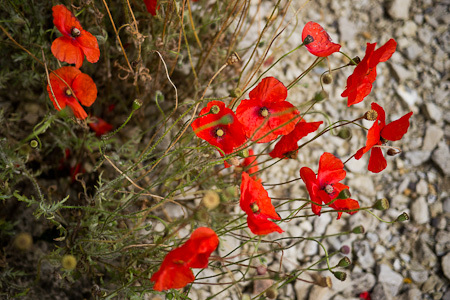 These photos were taken with a Panasonic GH2, using Lumix 14mm (28mm), 20mm (40mm) and 45-200mm (90-400mm) lenses. Looks great, the pic of the chips made me hungry (although not half as hungry as your Columbian food pics). But one correction, you know full well you’ll never achieve an ‘ultimate’ set-up, you’ll never be able to resist trying something new! The Booster Rocket looks great though, I’m tempted by one of those. Anyway, best wishes on the recovery. Its such a pity we can’t sue bugs and viruses for compensation…. But what about those figs… As good as any Colombian mango! Ah yes, and figs can add a bit of an additional rocket booster if you eat too many….! Lovely pictures & great to hear you’re back on the bike. I’ve just got back from a long weekend with friends in Staffordshire. A nice ride down through twisty Cheshire lanes, barbecued burgers & beer whilst trying to prevent kids cremating themselves on a bonfire. An easy ride along towpaths with good cafe stops & lots of banter. Took 2 days to ride home via the edges of the Peak District and then more lanes & towpaths home. Made jealous as another friend has packed the job in & is riding to Oz. I love that your frisbee is multi-purpose. 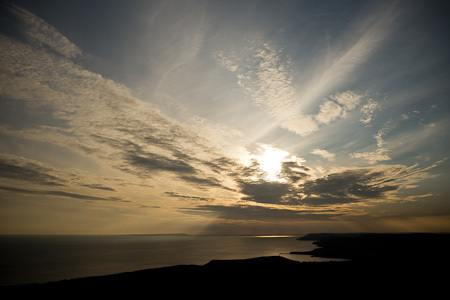 You’re making me homesick, wonderful Kimmeridge! May I ask what shoes you are using for riding? A bit hard to to tell by the pic? Hi. They are Keen Springwaters, a mountain bike/leisure shoe. Cool, Thanks! Love this site, keep up the good work! BTW nice blog you have there. Keep it up!